Welcome to Medi Safe International, Manufacturer of Wide Range of Anesthesia Equipments. We are an ISO 13485:2003 certified company, established in 1999. Our Highly qualified workforce and globally renowned company make us different from others. Complete clientâs satisfaction, high quality products and Deep focus on each customer make us the first choice of our clients. Re breathing Bag, Vacuum Extractors and Silicone Resuscitators are some of our products. 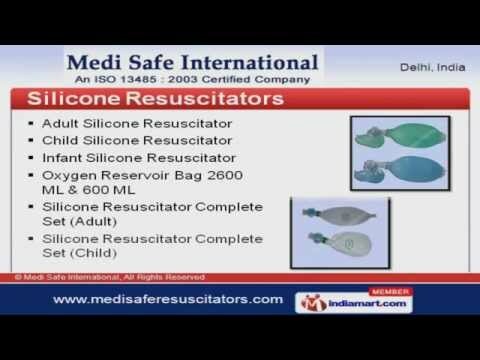 We offer a wide assortment of Silicone Resuscitators that are extremely reliable. Black Rubber Resuscitators offered by us are best in the industry amongst others. Our organization is highly involved in providing an impeccable range of Antistatic and Silicone Face Mask. We also provide Anaesthesia Circuits that are nothing but the best solution for all your needs. Along with that we offer Anaesthesia Products that are some of our best selling products.